Hamilton at the Big Apple Convention in Manhattan, October 17, 2009. 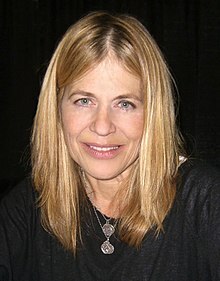 Linda Carroll Hamilton (September 26, 1956) is an American actress best kent for her portrayal o Sarah Connor in The Terminator an its sequel Terminator 2: Judgment Day. This page wis last eeditit on 6 Mairch 2015, at 03:47.